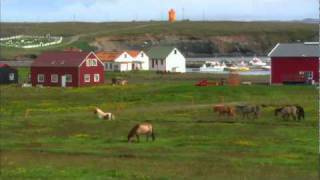 Raufarhöfn is a fishing village with 250 inhabitants and is also the most northerly community in Iceland. Because of its position, Raufarhöfn has the longest days in Iceland during the summer and the shortest ones in winter. The Arctic Circle lies just off the coast and in the village an arctic henge is being prepared. There is a good camping site with excellent facilities, including showers and electric hook-ups for caravans, tent trailers and camper vans. And for the youngest and most energetic members of the family there is a playground, situated close to the elementary school, and a sports centre beside the camping site. In Raufarhöfn can be found all the basic services, such as a health centre, chemist's shop, food store, a bank, post office, petrol station, garage, hotel, pub, gallery, etc. And from the village it is possible to book a sail to take you north across the Arctic Circle. There are many other pursuits which may tempt the visitor, for example bird watching, fishing by the harbour or in one of the many lakes and rivers, or going for a walk on Höfði or around the flatlands of Melrakkaslétta. GPS Points N66° 27' 19.080" W15° 56' 46.192"
Located by the swimming pool. Hotel Nordurljos is located near the centre of the quayside with a view across the harbour where it is possible to observe the fishermen in the afternoon when they land their catch from their small fishing boats.